When searching for a gift, not only are you thinking of the specific person in mind but your also wanting to show your true feelings, that will hopefully convey and express when the recipient receives your special gift. The list is endless when choosing a gift for someone from chocolates to yes, socks.... everyone has received socks either for Christmas or Birthdays and while our feet might be grateful, your mind is thinking, you really didn't put much thought into it. Receiving a gift that has "Meaning" whilst adding a personal touch, really is much more soul fulfilling and heart warming than any expensive gift, you might be given or sending to someone. Personalized flowers offer a unique service that really can make a statement to either a loved one or friend. 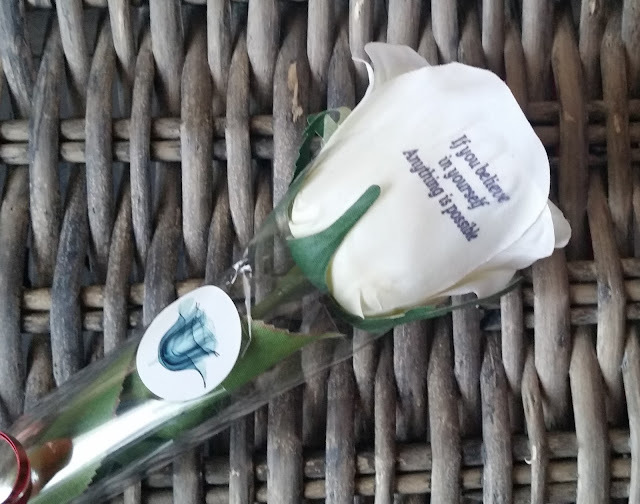 Personalising a rose with your chosen message can make any ones day sunnier and even bring a smile to their face. Available in the colours orange, white, yellow and pink with a choice from a real rose or a silk rose, all you have to decide is what message you would like printed on the colourful flower. The rose will be packaged into a individual letterbox friendly presentation box, whilst wrapped in cellophane with a ribbon around the stem adding a nice touch to your personalisation gift. Weddings, Birthdays, Christmas, Christenings or even for that special someone who is in hospital and flowers are not allowed, the silk rose is ideal! Head on over to Personalized Flowers and organise that special gift you can send for a loved one, they even ship worldwide! X Neil.